Types of Work Processes in SAP? 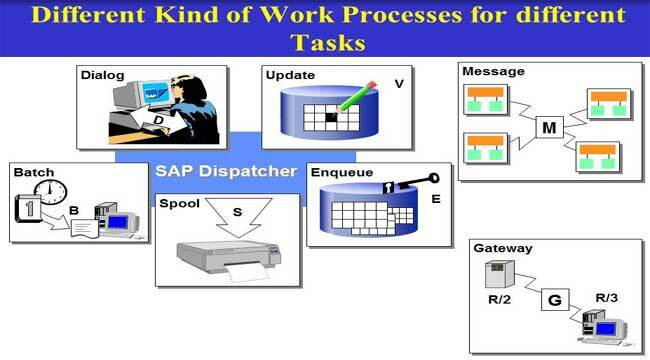 To process SAP requests from multiple front ends SAP application server is used. The application server has the use of a dispatcher, which collects the requests and paas them for processing to the work processes. Then the work processes execute the desired requests (for example, an ABAP program). A work process holds the ABAP interpreter, the database interface, the task handler and a screen processor that calls programs. Dialog To Fulfill all requests for execution of dialog steps triggered by an active user or execute dialog programs. Background It executes those programs that run without user interaction or executes time dependent or event controlled background jobs. Update It executes Update Requests or Asynchronous database changes which are controlled by a COMMIT WORK statement in a dialog work process. Spool It pass sequential data flows onto Printers or Print Formatting to printer, file or database. Enqueue Administers the lock table in shared memory or If SAP transactions have to synchronize themselves it executes locking operations. The Dialog work process fulfill all requests for the execution of dialog steps triggered by an active user. The dialog work process are not used for request which take long time and which use more cpu. Every dispatcher requires at least two dialog work processes. The dialog work process default time is 300 secs. If the dialog work process does not respond in this time, it will be terminated. Also dialog work process are multiplexed to handle large no of user request. Learn more about multiplexing here . You can set the maximum response time of dialog work process from transaction rz11 & set the parameter rdisp/max_wprun_time to time you need. The no of dialog work process can be changed by changing the parameter rdisp/wp_no_dia. The background work processes execute programs that run without user interaction. At least two background work processes are required per SAP system. More than one background work processes can be configured per dispatcher. Usually the background work process are used for carrying jobs that take long time to finish, like client copy, client transport etc.., Then no of background work process can be changed by changing the parameter rdisp/wp_no_btc . There are two types of background work process. They are A type and B type. A type background work process are used for mission critical jobs. Background jobs of priority a have high priority than B type back ground jobs. Update work processes execute update requests. You need at least one update work process per SAP system and you can have more than one per dispatcher. The profile parameter rdisp/wp_no_vb is used to control the no of update work process and rdisp/wp_no_vb2 for not of update work process of type v2. There are two types of update work process. They are v1 and v2. v1 update jobs have higher priority than v2 jobs. v1 jobs are used for critical jobs. There must be at least one V1 update work process in the SAP System. However there can be more than than one.V2 modules describe less critical secondary changes. These are pure statistical updates, for example, such as result calculations. The Spool work process pass sequential data flows on to printers. Every SAP system requires at least one Spool work process. However, there can be more than one per dispatcher. The parameter to set the no of spool work process is rdisp/wp_no_spo. The Enqueue work process administers the lock table in the shared memory. The lock table contains the logical database locks of the ABAP stack. Only one enqueue work process is needed for each SAP system. This is present on the central instance. You can determine or find an central instance by looking the the various work process present in it. For example, only the central instance contains enqueue and message work process. rdisp/wp_no_enq. It is not dynamically switchable. You can see an overview of all work processes in the application server by calling Transaction sm50. Read Here for More SAP BASIS Tutorials. Go to SM37 and Check the time. How to upgrade oracle patches? ?